Chasing Rainbows was recorded at Black Tornado in Copenhagen during the spring/summer 2007 and is a sort of return to the production ethics of the debut album Blows Your Mind (meaning totally DIY, lots of tape machines and crappy vintage gear, no plug-ins and no fiddling with the tracks in Amateur Tools). Chasing Rainbows is the sound of a band with more musical guts than in the past. 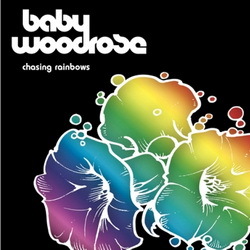 Clearly inspired by the Baby Woodrose side-project Dragontears the band have expanded their sound and produced an album that is very different from earlier efforts. Not only because of the use of instruments like cello, lap-steel, flute and tablas. But also because CHASING RAINBOWS is both their most poppy and commercial release AND their most experimental and druggy album so far. The first part of the album contains cool psychedelic pop songs like “Someone To Love” and “I’m Gonna Make You Mine”. Later on (or in vinyl terms – on Side B) things get darker and moodier both lyrically and musically. The inspiration from Dragontears gets more obvious and songs like “Renegade Soul” and “Dark Twin” will surely surprise a few people.